datasets. The areas affected by the 1997 fire are coloured in red and orange. Peat swamp forests play important roles in the regulation of hydrology, the maintenance of biodiversity and in global climate regulation. In tropical areas they are being depleted by logging and land conversion activities, especially by fires. In autumn 1997, fire raged out of control in the "Mega-Rice Project" area in Central Kalimantan, Indonesia, where over one million hectares of land was earmarked for conversion into agricultural land. The impact of this fire on the vegetation in this area was studied using satellite remote sensing imagery and by ground and aerial surveys. 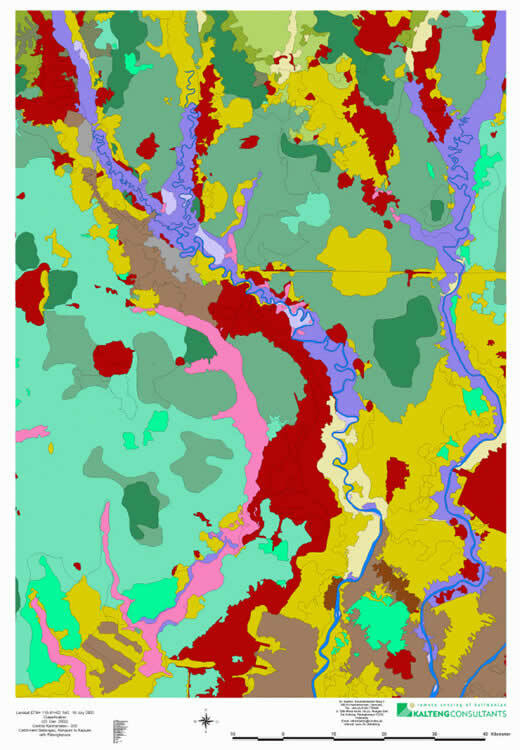 This study focuses on the use of interferometric synthetic aperture radar technique in mapping vegetation cover change. ERS SAR imagery over the area of interest was acquired during two tandem missions in April 1996 and October 1997. The change in vegetation cover was mapped by comparing the change in coherence and backscatter intensity. The results of the ERS SAR analysis were checked on the ground and during aerial surveys in part of the study area in June and November 1998 and August 1999. Comparison with SPOT images acquired during the fire period and Landsat TM images acquired before and after the fire period confirms the interpretation of the ERS interforemetric SAR images. NOAA images to count hot spot information were also used. New huge fires were observed in autumn 2002 (End July to End of October) over the island of Borneo caused by draughts of the next El Nino Southern Oscillation (ENSO) five years later. Fires and smoke can be detected with the NOAA and with the MODIS sensor (e.g. on 18. Aug. 2002) covering the whole period. It seems that now every year for several months during the dry period smoke and haze conditions around Palangkaraya and the MRP area become the norm.